Radiography is an ever-changing art and science that offers a rewarding career for students eager to accept the challenges that come from working within a multidisciplinary healthcare profession. media in patient care lab. 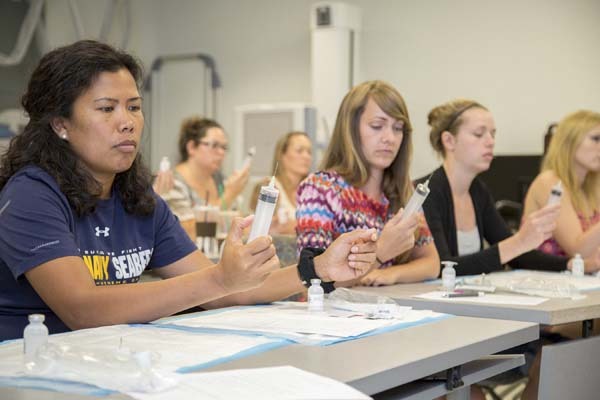 After completing a two-year Associate of Applied Science in Radiography at Tidewater Community College, graduates are able to begin work immediately in health care settings that range from hospitals to imaging centers to clinics and doctors’ offices. TCC’s radiography program requires six consecutive semesters of full-time study. The application deadline is Dec. 18, for the competitive program, which accepts 38 students and begins a new class in the summer semester of every year. 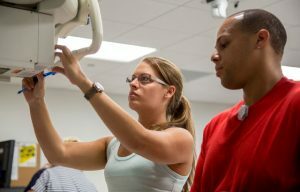 Students benefit from state-of-the-art equipment offered in the Regional Health Professions Center on the Virginia Beach Campus. 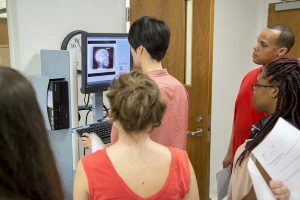 During their initial semester, they gain hands-on lab experience in patient care and imaging, where they learn skills and principles that prepare them for the clinical environment. TCC has the capability to teach radiography across a continuum from basic film radiography through digital tomosynthesis. Faculty start by teaching the basic principles, and students begin in the lab by producing traditional radiographs on film. They progress to using computed radiography plates (CR) to produce analog latent images that are digitally processed. Students move on to direct digital radiography (DR), digital portable radiography and then to specialized techniques, such as tomosynthesis and image pasting. The DR X-ray machine housed in one of the four radiography labs in the Regional Health Professions Center is a hospital-grade, state-of-the art machine. The ensuing semesters involve almost 1,500 hours of clinical experience. TCC has affiliation agreements with every major hospital in Hampton Roads. Konica computed radiography (CR) reader. Prospective employers in the clinical setting get a firsthand look at the students’ performance as a prospective employee, and many are hired upon graduation when positions are available. Graduates are prepared to apply to the American Registry of Radiologic Technologists to take the national certification exam. TCC graduates pass the exam nearly 100 percent of the time. Prior to enrolling in the program, students must have completed Human Anatomy and Physiology I (BIO 141). Utley said successful students are multi-taskers with excellent critical thinking skills. A radiologic technologist does not need a bachelor’s degree, but students who plan careers in education, management and sales should consider that option. 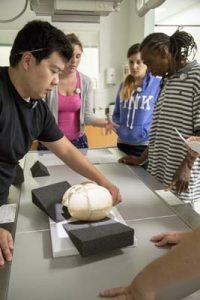 TCC offers transfer agreements with Old Dominion University and St. Joseph’s College and has a pending agreement with the University of Virginia. while Charles Mayo looks on. Utley brings 38 years of experience to the field, which she initially started in after working in the cafeteria in a Lynchburg hospital. Back then she wore a yellow uniform to work but envied the folks in the white uniforms who seemed so important. They were radiographers, nurses and other health care professionals. That inspired her to pursue her associate degree in radiography from Central Virginia Community College. She continued on to earn bachelor’s and master’s degrees from Old Dominion.